Congressional committees are kind of like Hogwarts. Congressional committees are a bit like the four houses of Hogwarts School of Witchcraft and Wizardry — some are more desirable to get into than others. So, which committees are more Gryffindor than Slytherin? 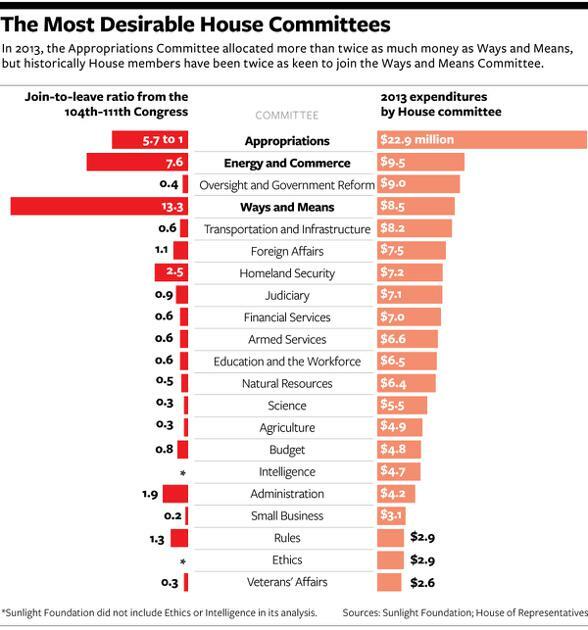 In the House of Representatives, three committees have historically attracted the most members: Ways and Means, Energy and Commerce, and Appropriations. 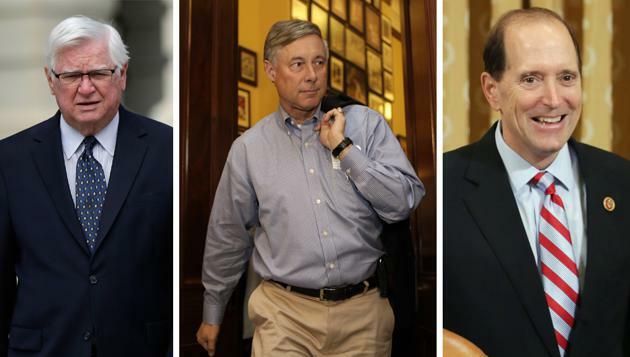 They are led, respectively, by Republican Reps. Dave Camp and Fred Upton of Michigan, and Harold Rogers of Kentucky. When trying to suss out what makes some committees more desirable than others, there are two factors that drive all things in politics: money and power. Consider the operating budgets and how much money each committee spent on its own business in 2013 alone. The Appropriations Committee, which controls U.S. spending policy, spent $22.9 million in the 2013 fiscal year, including more than $18.7 million for staff pay. With only 39 members — smallish by congressional standards — a seat on Ways and Means is a rarefied assignment. Twenty-one House speakers, eight presidents, and four Supreme Court justices have served on the panel. When newcomers want to join, they typically have to wait for someone on Ways and Means from their state or region to retire, lose reelection, or die. The vague-sounding committee — just what is "ways and means" supposed to mean? — is the oldest in Congress, created to deal with tax policy. That's because the Constitution requires that all bills for raising revenue shall originate in the House. But the committee does much more than discuss tax policy — it was in front of the Ways and Means Committee that Kathleen Sebelius testified about the failed rollout of the Affordable Care Act. Second to Appropriations is Energy and Commerce, led by Upton. As Amy Harder wrote last April, Energy and Commerce has the broadest jurisdiction of any committee — "anything that moves, burns, or is sold." For that reason, Energy and Commerce comes in second only to Ways and Means in the number of bills that get referred to it. Since it also oversees the Department of Health and Human Services, the committee's hearings were Ground Zero for the debate over Obamacare. And though he may not be as famous as his niece Kate, Chairman Upton is known as "influential, persistent, and friendly" among his colleagues. "Some of the most talented and knowledgeable members on Capitol Hill from both parties serve on Energy and Commerce, and we work hard as a team to produce meaningful legislation, conduct rigorous oversight, and shine a light on issues at the forefront of our national debate," Upton said in a statement to National Journal. An honorable mention goes to the House Oversight and Government Affairs Committee, which is tasked with investigating fraud and abuse in the federal government. The committee came in third in terms of its 2013 operating budget. And the committee's chairman, Rep. Darrell Issa of California, has garnered many incendiary hearings (and even more headlines) with his committee's work. Think of the IRS or Benghazi scandals — they wouldn't have had nearly as much staying power without Issa's dogged pursuit of Obama proxies like Eric Holder, Hillary Clinton, and now John Kerry. "As has been exhaustively documented, our federal government wastes billions of dollars each year, either through mismanagement or through outright stupidity," Issa wrote in a joint statement asking for more money last March. "The Oversight Committee is in a unique position in that for every dollar you invest in us, we return it one hundred — or perhaps one thousand — times over in potential savings." But in terms of power and desirability — both real and perceived — these three chairmen are Congress' Most Wanted.